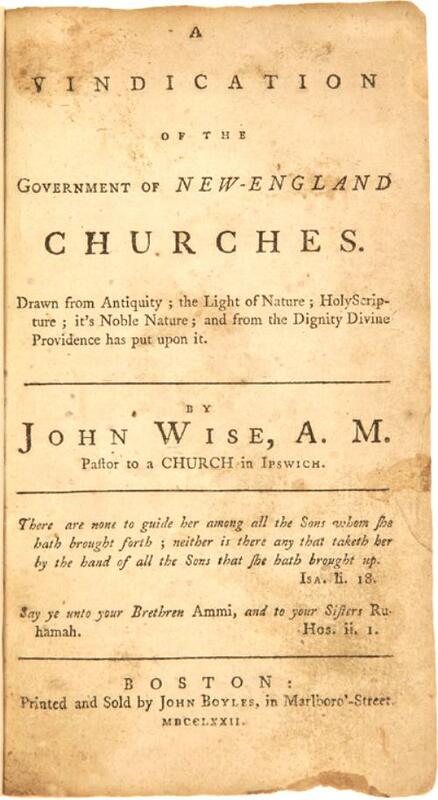 One Eternal Day: "We hold these truths to be self-evident..."
...[H]is masterwork in 1717, [was] A Vindication of the Government of New England Churches, in which he dealt with the basis of both religious and civil government. God created all men equal and every man must be acknowledged by the state as equal to every man. The end of all good government is to promote the happiness of all and the good of every man in all his rights: his life, liberty, estate, honor, etc. The consent of the governed is the only legitimate basis for government. ....[I]n his book Seedtime of the Republic, Cornell University historian Clinton Rossiter traces six individuals that he considers the most influential thought leaders of the American Revolution. Interestingly, two were political leaders but four were ministers of the Gospel. 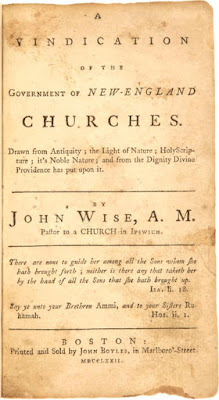 Among those, Rossiter lists Wise, whose pulpit and pen provided some of the soaring thoughts in America’s founding document, thoughts that compose the very foundation of our republic. Whether Wise was a good biblical scholar I would leave to those who are qualified to judge and have read him. But his first assertion is fundamental to our Revolution and we have been working out its meaning ever since. G.K. Chesterton made the same argument in 1922: "The Declaration of Independence dogmatically bases all rights on the fact that God created all men equal; and it is right; for if they were not created equal, they were certainly evolved unequal. There is no basis for democracy except in a dogma about the divine origin of man."